Everyone’s done it in my family but me. When my sister called and said mom and dad wanted to take the Star Princess cruise to Alaska in August, round trip from their homes near the San Francisco port I balked. They had all cruised before. Despite traveling all over the world, I’d never been on a cruise. Somewhat claustrophobic, I thought I would have difficulty handling the captive crowd. 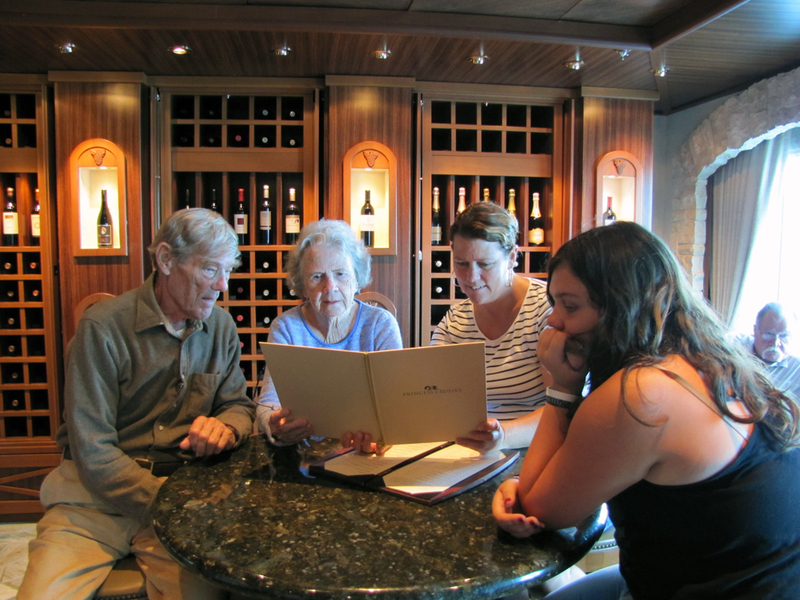 It would likely be the last cruise for my parents – the last family vacation for us. How could I not join them? And once there, what in the world is there to do onboard to keep from getting bored like the kids we once were on family vacations? Back then, our parents tossed us in the station wagon for the obligatory hot summer car trip to historic sights. No seat belts required, no air conditioning either. We were so bored we frequently scrambled over seats, stuck our feet out the windows, whined about our confinement and repeatedly tormented our parents with, “Are we there yet?” We couldn’t wait to escape the confinement and run around the campground. Some summers and winters, we joined other families in various mountain condos for ski trips or weeks at a California lake near Tahoe, California. Although we kids were along for the ride, we were aware of the stressful toll all that organizing and planning took on my mother. Now that my parents are in their 80s, they don’t need the stress of planning. We kids are in our 50s and we all wanted a stress-free vacation – no cooking, cleaning, drama, washing dishes, with activities we could engage in or ignore depending on how we felt that day. The Star Princess Cruise from San Francisco to Tracy Arm Fjord with a few stops in Alaska seemed perfect. The arrangements were made and I flew to San Francisco to join them – in a balcony room of course. As soon as I arrived in San Francisco’s airport I understood why older people love to cruise. A cruise ship representative held a Princess sign near the baggage claim and I walked over to her. She helped me gather my bags and take them to the waiting area for the bus that would take us directly to the cruise ship. Most of those along for the ride were in their 60s through 80s. One couple had cruised to Alaska 8 times and raved about the Princess cruise line. The consensus I was to hear repeated throughout the cruise by almost every veteran cruiser who had tried out at least three different cruise lines, was that Princess had the best itinerary, best food and best service. Once unpacked in my stateroom, I wandered around and waited to join the rest of the gang. It wasn’t long before they found me. My sister’s boyfriend had driven them all to the port and toured the ship with them. They all piled onto my balcony to chat until he had to leave and we were summoned to the safety briefing before we could sail away. During the course of the 11-day cruise, the balcony was a godsend. I kept the door open all night long to listen to the waves; the partitions outside acting as wind breaks so the cabin never grew too cold. My room became our gathering place to gaze at the super moon that cast its beams on the open sea, to ah at the waterfalls tumbling off the cliffs as we entered the fjords, and to watch this huge ship turn on its thrusters and park itself between two cruise ships with few feet to spare on the bow and stern. Impressive feat. During the long days at sea, we all found our special nook to hideaway. Melissa and Zoe stationed themselves in the Skywalker’s Lounge above the end of the ship with comfy couches and windows that offered stunning views that shielded them from the wind. At age 14, Zoe decided she didn’t want to hang out in the teen center and chose to hang out with her mom yet kept her earplugs tuned into her iPhone. And mom cherished the time with her, keeping both her ears and her heart tuned into Zoe who lives only part time with her, sharing custody with her father. The food was great as well. I usually ordered fresh fruit and coffee delivered to my room every morning and a pot of hot water for my French press mug and personal stash of Pete’s coffee. I’d sit back in a chair, put my feet up against the skidding glass door out of the wind, sip and wake up to the beauty of the ocean white caps. Melissa and Zoe ate in the Horizon Court buffet, as did my parents. 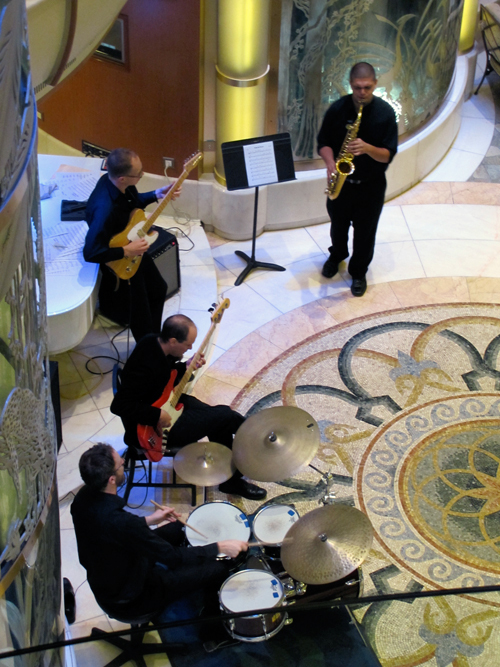 Lunch was usually downstairs where we snacked on sandwiches at the central café and watched the other cruisers walking around the open atrium or dancers taking center stage between the long columns of glass elevators beautifully encased with decorative metal art. This area was Zoe’s favorite place to people watch from the top balcony looking down to the floor where we often ate our lunch. She thought the area beautifully designed and the perfect set for the ballroom dance couple that drew the attention and fired the imagination of all. For dinner, we opted for anytime dining and usually ate in the Portofino dining room where the quality of the food was great and we felt like we had our own private waiter. None of us really participated in the nighttime activities like dancing and nightclubbing. My sister and her daughter snuggled up in blankets in the aft of the ship near one of the pools, and stared at the evening movie on the giant screen under the stars almost every night. I joined them on a couple nights. All warmed up under a couple of blankets, one of us usually drifted off to sleep on the lounge chair until the movie ended and we trudged off to bed. We all agreed that this was our favorite time and place together on the ship. One afternoon, while dad took off with Melissa and Zoe, mom and I attended one of the many art actions with free champagne. I sat next to a man my age, a veteran cruiser who explained the bidding process, the shipping of art and framing costs. He said that more art was sold on cruise ships than on land. Eventually, I would also see that more jewelry customers flocked about on ships and in port than I’d ever seen before in small stores or malls. 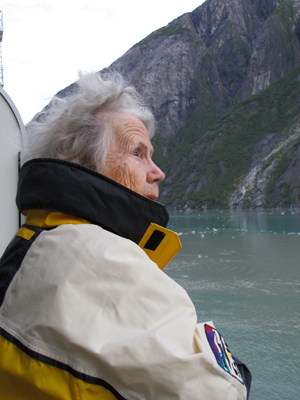 Both mom and sad loved being in the open air, dad’s Norwegian blood relishing in the days at sea. We often walked the deck, arm in arm, stopping once in a while to stare at the whales spouting. Once, they came so close that we both laughed in delight. We frequently spotted whales and dolphins during the cruise. On shore days, we all split off into our own adventures, coming together afterwards to tell our stories of the day. While Melissa and Zoe pre-planned their adventurous shore excursions like zip lining and kayaking, my parents and I decided to wait and see how we felt that day and figure it out from there. In Ketchikan I escorted my parents to a tour bus to cruise the town and gape at the totem poles and enjoy the historic tidbits in the light drizzle. The tour gave them a sense of direction and they walked through town afterwards, shopping, enjoying the novelty of being in the cool air of Alaska, out of the heat of California. I jumped on a fishing boat to try my luck at hauling in a salmon. No luck but the scenery was beautiful. In hindsight, I would never book a day fishing trip in Alaska in August. The best way to fish Alaska is in season, based at a fishing lodge where local guides help you haul in a record catch. Juneau gave us a longer stop. But the rain was light and steady when we all bussed over to see the Mendenhall Glacier calving ice chunks into the lake and hoped to spot a bear. Melissa and Zoe went kayaking while I walked with my parents around the area. Eventually, I left my parents in the Visitor’s Center, donned the hood of my jacket and trekked up the hillside trail for a higher view of the glacier and waterfall spilling into the lake. Along the trail I heard the unmistakable growl of a bear very close by the upper streambed and picked up my pace. Black bears are shy, preferring to huff and growl than leap out and announce its displeasure at your company. I never saw him. By the time I returned, dripping wet to the Visitor’s Center, Melissa and Zoe had showed up and were keeping my parents company. Later that evening, when all had re-boarded the ship, a friend came by the port to whisk me up the tram for a bite to eat high above the little city. The view was spectacular. I could have spent all day hiking the trails on the top of the mountain. We watched the sunset and the time for me to return to the ship seemed like an annoying curfew imposed on a young teenager – Be home at 8 pm sharp! Our next port was Skagway where mom and dad took off on the train to White Pass, the infamous pass of the Klondike gold rush era leading to the Yukon where they reveled in stories of the early gold rush days and the adrenalin rush of riding up the cliff side. It was the highlight of all shore excursions they had ever taken while on a cruise. They raved about it when they returned. I boarded the high-speed ferry to Haines, a quaint old Fort town, to visit friends. They picked me up at the ferry and we stopped for coffee at the local whole foods store. After a while, we drove to the library where we watched their son-in-law, a master carver, working on the totem pole that lay horizontal outside. Deciding it was time for a little fishing, we went to pick up the boat at their house overlooking the end of Lutak Inlet. A little ways down the road from their house, past the eagle standing in the edge of the river, we turned right onto the road that led to Chilkoot Lake, noticed a few fly fishers wading out in the river, and dropped their fishing skiff off at the boat ramp. Within minutes, we were skimming across the lake. Suddenly, a large, dark brown figure emerged from the trees at the lakeside and we cut the engine, drifting in for a closer look. I had hoped to see a bear and there she stood, big as a baby elephant and shyer than my niece. After she retreated from sight, we pulled the boat back from shore and moved to their favorite fishing spot where we saw a couple pontoon boats full of cruise ship tourists frantically casting their lines and jerking them in empty. We took a little ride until the pontoons left and moved in close to the stream where giant salmon spawned. The trout lurked beneath them so we baited hooks with chunks of salmon eggs bound by red Jell-O and salt and tossed it in their direction. Within 30 minutes I had hooked 4 decent trout. We left that night for the slow cruise to Tracy Arm Fjord and I awoke to see a green cliff side spouting a waterfall tumbling into the sea 100 yards off my balcony. It was early. So I went downstairs to the coffee shop and picked up a couple of triple shot cappuccinos, returned to my room and called my sister. The whole family trooped to my stateroom on the port rear side of the ship and gaped silently, sipping coffee as we cruised through this spectacular cathedral. Dad slipped his arm over my shoulder as we stood at the rail, two old sailors who love the sea. He was raised in Tacoma, Washington and I had settled in Washington after college. We were the north westerners of the family. The rest had stayed native Californians. Our bond was forged in an ancient bloodline of Vikings I am sure. Mom sat bundled up in fleece and blankets. Zoe sacked out on my bed, as it was only 6 am. Melissa stood silently by, her thoughts a mystery. We stayed silent because the deepest bonds of love need no words during a shared experience and it makes the moment all the more powerful a memory. Our last stop was Victoria, British Columbia where we all strolled through a city we were all familiar with and had so little time to enjoy before we left for the long passage back to San Francisco. It may have been the only cruise we would all take together, perhaps even the last vacation as a family, but it wasn’t the last dinner we would all sit down together and share. After all, Thanksgiving was coming up. If only we had the Princess cruise chef come to the house to prepare it for us and a staff to handle the dishes. Princess Cruise certainly spoiled us with everything and seemingly ever staff at our beck and call. We had plenty of fun time together, interaction with many three-generation family parties also on board, and alone time to read and recharge. It really was the first no-stress family vacation we’d all ever experienced. I’m hoping it isn’t the last. 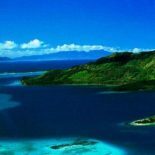 As is common in the travel industry, Princess Cruise provided the writer with the cruise to research this article. The opinions of the writer, and the fun she had, are her own. This entry was posted on September 2, 2014 by Crazi Culture in Crazi Cruises, Island Hops, and Underwater Destinations, Crazi Wild West, Uncategorized and tagged Alaska Cruises, Cruising with family, fishing Alaska, Haines, Juneau, Ketchikan, Princess Cruise, Skagway, Star Princess, Tracy Arm Fjord.